The INOX is an iconic, rugged chronograph. They come in several colors. They are minimal yet perfectly designed. The rubber straps are durable for active lifestyles and the movement is phenomenal. A must for the sporty collection. This Beautiful Luxurious Victorinox I.N.O.X. 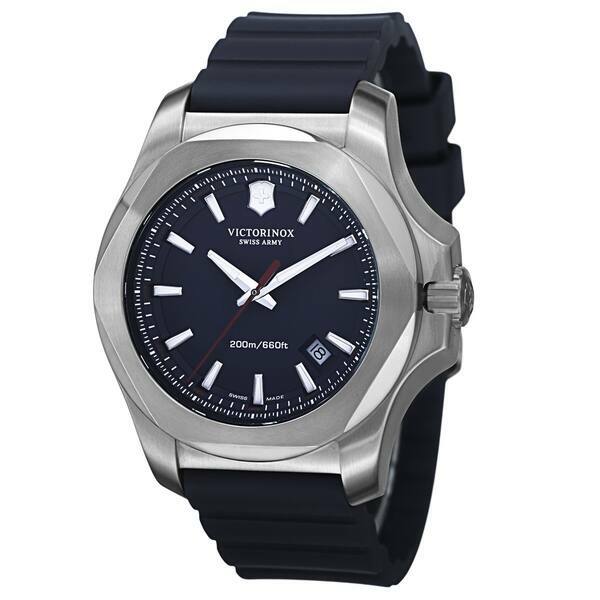 Blue Dial Stainless Steel Men's Watch 241688-1 features: A 43mm Stainless Steel Blue dial, which is approximately 14mm thick. The crystal is made out of scratch resistant Sapphire crystal. It is driven by a Quartz movement, with a water Resistance of 200 Meters. This Watch has a Stainless Steel case back with a Buckle closure. The Swiss Army Limited warranty covers the watch functionality for up to 2 years. A great looking watch. Very comfortable large watch to wear.